Russian Meteor: How Many Tiny Asteroids Buzz Earth? 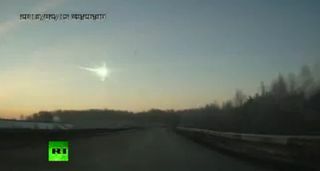 The meteor that exploded over the Urals region of Russia in February was a violent reminder that our planet exists in a cosmic shooting gallery. Now, astronomers are focusing on these mysterious small and possibly dangerous objects in the hope of understanding what they are made of and what kind of threat they pose in the future. Though rare, impact events by objects like the estimated 56- to 66-foot-wide (17 to 20 meters) chunk of space rock can cause serious damage to populated regions. The city of Chelyabinsk suffered around 1,200 injuries and millions of dollars’ worth of property damage when the shock wave from the disintegrating meteor hit the ground — what if this happened to another city like New York, London or Moscow? In new research headed by Amy Mainzer, of NASA’s Jet Propulsion Laboratory in Pasadena, Calif., a population of NEOs smaller than 330 feet (100 m) wide that invade our planet’s orbital space were studied using data from NASA’s Wide-field Infrared Survey Explorer (WISE). Taking their cue from small asteroid discoveries made by ground-based visible light surveys, 106 previously unreported infrared observations of small NEOs were analyzed. Inspired by the Chelyabinsk event, Mainzer and her team set out to survey this poorly understood population of small NEOs. "What can we learn from these objects, particularly the small ones? What is the smallest object that we could see with WISE?" Mainzer asked. WISE was used to carry out a wide-field survey of asteroids before the mission was put into hibernation in Feb. 2011 — a survey known as NEOWISE, of which Mainzer is principal investigator. The software used to analyze the NEOWISE data was set up to confirm the detection of asteroids that were observed five or more times, in order to avoid registering false positives such as transient events like cosmic ray hits on WISE’s optics. Small objects zooming through the WISE field of view at relatively close distances can be tricky to track, a situation Mainzer likened to a speeding train. "When you see a train from far away, it doesn’t seem to be moving very fast, but when you stand right next to it and it zips by you… now it looks like it’s moving really quickly," Mainzer told Discovery News. Many of these objects zoomed past the Earth at only a few Earth-moon distances, but their infrared signatures could still be used to evaluate the physical characteristics of these rocks. One of the key findings of their work, which has been accepted for publication in the Astrophysical Journal (available also on the arXive pre-print service), is that visible light surveys likely have a bias against detecting small, dark asteroids. "When we look at the visible light-selected sample — tiny NEOs discovered by ground-based surveys — we see a distinct trend: the smaller you go, the brighter the objects appear to be," said Mainzer. "We know that visible light surveys are going to have a hard job of discovering objects that are both very tiny and very dark because they are faint to a visible light telescope." When analyzing the selected NEOs (discovered in visible light) through WISE’s infrared data, they found that it’s likely that no such bias exists in infrared wavelengths. Also, there is little correlation between heat and reflectivity. In other words, if two asteroids are the same size, a bright asteroid will emit about the same amount of heat as a dark one. Therefore, an infrared telescope is roughly equally sensitive to dark and bright asteroids, whereas the dark asteroid looks fainter in visible light. This observation alone gives pause for thought. If visible light surveys are biased toward seeing only the brightest (high albedo) space rocks, are a whole population of dark (low albedo) NEOs being under-detected? In short, we just don’t know. "With our previous NEOWISE studies, we found that about a third of NEOs larger than 100 meters are dark. It’s possible that a population of smaller dark asteroids exists, but we don’t have the right sample to test that theory with what we’ve done so far (in this research)," said Mainzer. "In my opinion, it is probable that a similar fraction of small NEOs are dark, but the visible surveys are biased against finding them. They do find some … but not many." Could the scarcity of small, dark NEOs be caused by some physical process that preferentially produces small, highly reflective asteroids? "There could be some physical process, but there’s no solid evidence one way or the other right now." This bias against finding small dark asteroids could be the Achilles Heel of visible light surveys and needs to be considered before arriving at any definitive conclusion as to the population of small NEOs. But, as Mainzer pointed out, visible light surveys are highly complementary to NEOWISE-like infrared surveys. "If you have infrared surveys alone, you get a pretty good idea of diameters," she added. "But you can’t say anything about the reflectivity of the surfaces in visible light. So you need a combination of visible light plus infrared together to really nail down the reflectivity, which gives you an important clue as to the asteroid composition." All of the objects studied by Mainzer’s team were classified as NEOs, a number of which are also potentially hazardous asteroids (PHAs). PHAs are objects that make a minimum orbital approach to Earth’s orbit of 0.05 AU (astronomical units; 1 AU is the average distance between the sun and Earth). "It doesn’t mean that the object and Earth will be in the same place at the same time, but it does mean their orbits get close to one another making this a population of interest," said Mainzer. On considering the impact of the small Chelyabinsk object earlier this year, it is perhaps sobering to realize that while around 90 percent of NEOs with diameters larger than 0.6 miles (1 km) are thought to have been discovered, less than one percent of asteroids the size of the Chelyabinsk meteor (17-20 meters in diameter) have been detected. Going back over NEOWISE detections of small NEOs acted as an experiment in an effort to understand the correlation between visible light and infrared surveys, but more work is needed to fully understand the composition of these mysterious small threats to Earth. In the near term, the hibernating WISE spacecraft is currently undergoing a restart operation that will bring it back online in the not-so-distant future to recommence its NEOWISE program. More detections of small NEOs will allow better statistical calculations to be made, refining our understanding of the visible light observation bias, ultimately making us better at detecting any incoming space rocks that have our planet in their cross hairs.